#1 – Hellmuth has not donned a UB Poker logo since October, which fueled speculation he and UB Poker would soon be parting ways. #2 – Both announcements happened within hours of each other and UB Poker quickly posted statements for both –before UB Poker’s statement Duke signaled she was leaving UB Poker on her blog, and there is still no word from Hellmuth on the split. #3 – Joe Sebok’s blog entry that followed the announcements is further evidence that the split was not a fly-by-night decision: Sebok revealed UB Poker would be making a major signing next week and that the company is looking to go in a new direction. This leaves UB Poker with a strong group of young poker pros on their roster, and plenty of sponsorship dollars to spread around to other players now that Hellmuth and Duke are off the payroll. In my opinion this is like cutting an aging superstar whose numbers no longer warrant their salary. 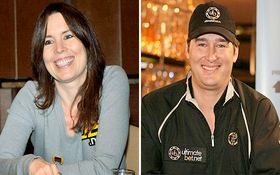 Duke says she has no plans to sign with another online poker room at this time, and Hellmuth, as I stated earlier, has been mum on the topic –although I think hear Harrah’s subscription-based WSOP poker site calling the 11-time World Series of Poker bracelet winner! This entry was posted on Friday, December 31st, 2010 at 2:45 pm and is filed under Poker Industry News. You can follow any responses to this entry through the RSS 2.0 feed. You can leave a response, or trackback from your own site.